Mitch Albom is an author, playwright and screenwriter, who has written seven books, including the international bestseller, "Tuesdays with Morrie," the best selling memoir of all time. 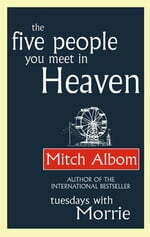 His first novel, "The Five People You Meet in Heaven, "was an instant no.1 "New York Times" bestseller that has since sold over six million copies worldwide. Both books were, made into acclaimed TV films. Mitch also works as a columnist and a broadcaster, and serves on numerous charitable boards. He lives with his wife, Janine, in Michigan. Mariano Antol n Rato is an internationally recognized translator. He lives in Spain.